This doesn't look as over-the-top as it is IRL - afraid I got a bit carried away! Black card, embossed and gilding waxed (or, rather, gold shoe polish), mounted on gold. Handmade paper with gold foil flecks, with gold on black fabric edging and black and gold cord tied over. Above that, gold paper, sort of handmade, with the greeting (on some more gold flecked paper) mounted on gold, then on black, and with gold-edged black velvet ribbon above. 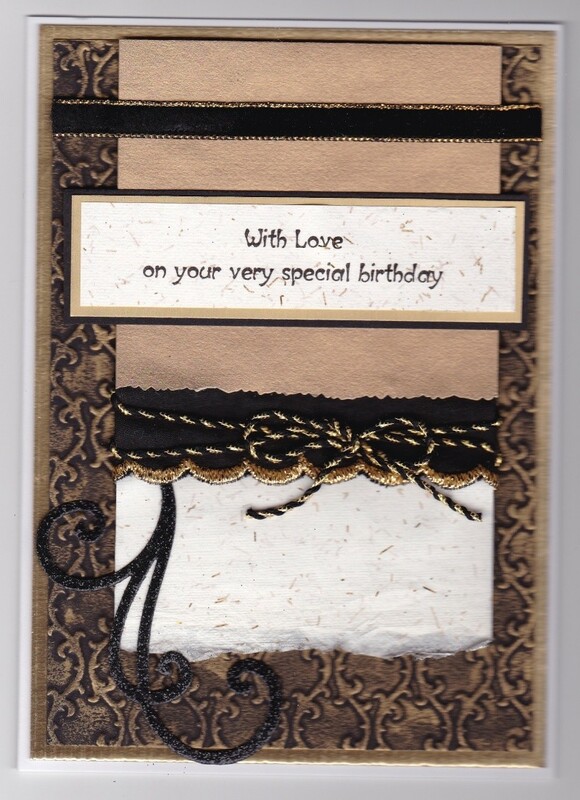 To finish, a flourish cut from black glitter card. It's so chunky that I've had to reinforce the back page by putting another piece of card (mounted on gold, of course) where I'm going to write the message. What a smashing special card for a chap. Sounds as if it's a good job you won't have to post it lol. I shall be posting it, Di: his birthday is on Tuesday, so I'm sending it care of the nephew he's staying with. Have put it in a cellphane bag in a board-backed envelope, which I'm pretty sure will keep it safe: as I don't use foam pads but always use a complete piece of cardboard to support everything, it won't get squashed. Hope it gets there safely. Very nice, ornate enough but still suitbale for a man, I like it.